Analtech SPICE Cartridges are prepacked with adsorbent and ready for use. Molded of medical grade polypropylene, each cartridge contains 1 cc of packing. A porous frit and outlet filter combination contain the packing and will remove sample particulate down to 10 microns.In normal use SPICE sample preparation cartridges are compatible with organic solvents and aqueous solutions. Precision Luer fittings provide leak proof liquid connections. The inlet is a female lock type and the outlet is a male slip. 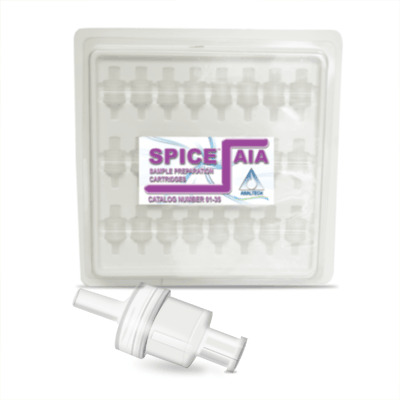 This unique design enables SPICE cartridges to be used either with a syringe or a vacuum manifold. Syringe use is ideally suited for field sampling or for intermittent laboratory requirements. Repetitive sample prep applications are conveniently performed via a vacuum manifold. Typical flow for either method is approximately one minute per 10 cc of fluid at 14psi. This insures sufficient sample residence time in the cartridge for effective adsorption/desorption.